If I lived in Seattle, I would have a lot to write about. My four days on holiday in Seattle were full of great places to eat. I could write about Russian Piroshki at Piroshky Piroshky, chowder at Pike Place Chowder, or one of the seven stops we made during our gourmet food tour by Savor Seattle. Last week I posted about an amazing omakase meal in Seattle. This week I wanted to write something a little more representative about the food in Seattle. I would have to write about Tom Douglas. I didn’t know much about Tom Douglas before I got to Seattle, but with twelve restaurants, it’s hard not to learn quickly. There’s a television show on the Food Network called “The Best Thing I Ever Ate.” Celebrity chefs will share their favorite things to eat and the food gets profiled. Two of my food idols, Tyler Florence and Giada DeLaurentiis both give credit to Seattle and both has Tom Douglas’ name on it. 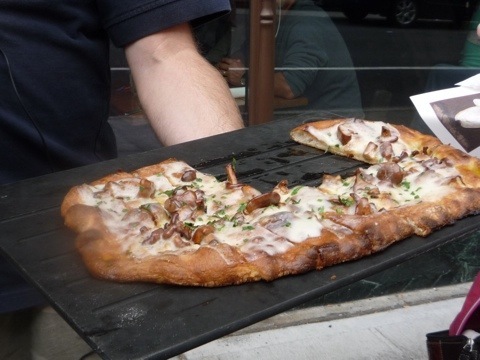 Tyler Florence loves the pizza at Serious Pie, especially the chanterelle mushroom and truffle cheese pizza. 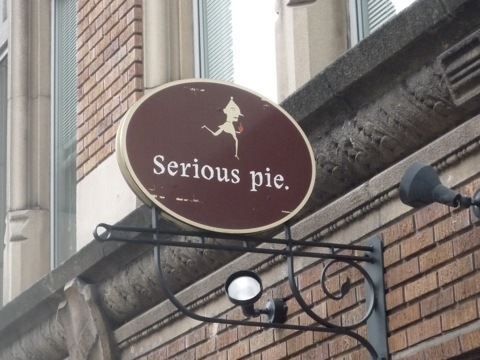 On the Savor Seattle food tour, we stopped at Serious Pie and tried Tyler Florence’s favorite as well as the yukon gold potato, rosemary, and olive oil pizza. The pizzas were delicious for me, not as much for my friend who is not a fan of thin crust pizza. It stays on my list and next time I’ll have to try a red pizza or one with tomato sauce. 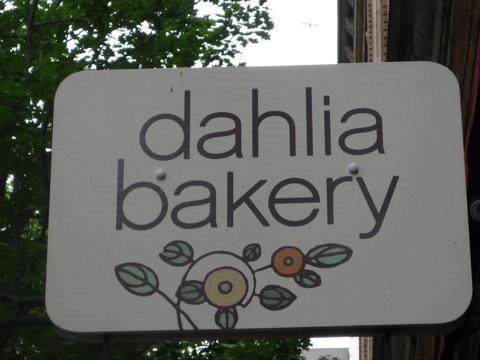 Giada DeLaurentiis loves the donuts at Dahlia’s Bakery and I do too! My friend and I decided to stop by and share the half dozen made to order donuts. They are more like beignets. 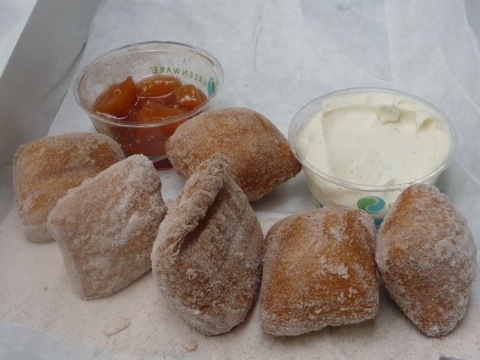 Not only are they hot, sugary, and deep fried, but they come with mascarpone cheese and homemade plum jam. We agreed, they were definitely one of the best things we ever ate. I was insistent that we have our final dinner at one of Douglas’ restaurants. 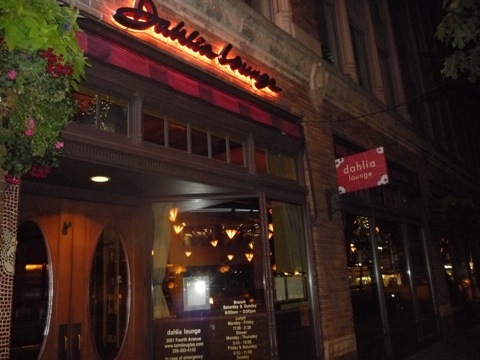 I decided it would be Dahlia Lounge, Douglas’ first restaurant which he opened in 1989. 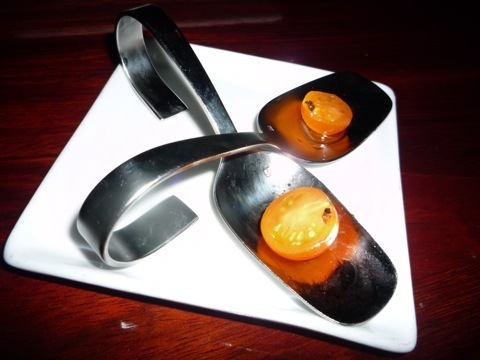 They offered us an amuse-bouche, which was simply a local grape tomato dressed up on a spoon. It was very sweet and tasted like candy. 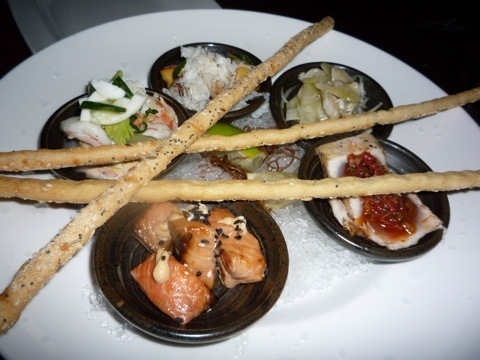 We ordered the sea bar sampler which came with shrimp, Dungeness crab, smoked salmon, geoduck, and Albacore tuna. It was fun to try a variety of different seafoods and their unique take on it. We shared two entrees. 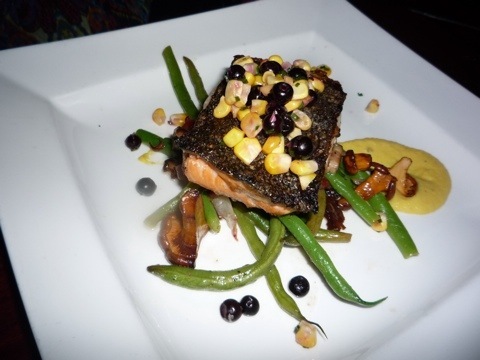 One was the salmon with green beans, bacon, chanterelle mushroom, sweet corn and huckleberry. It was a nice and delicate dish. 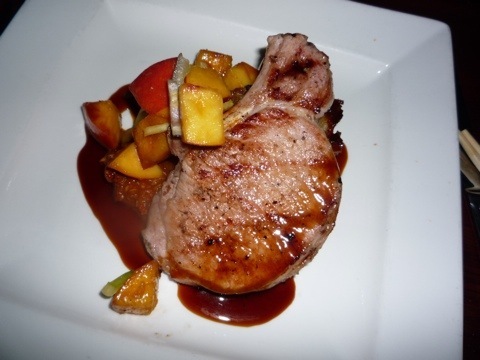 Our other entree was a pork chop with peaches and peppers in a romesco sauce. This was cooked perfectly and the flavors were spot on. 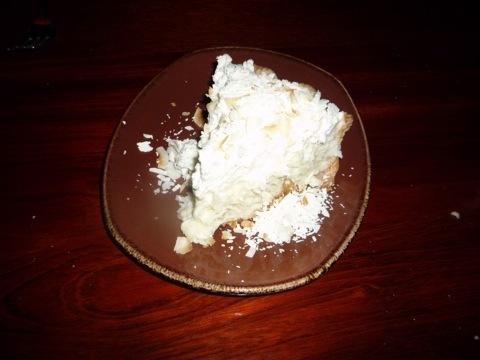 We heard a lot of great things about the triple coconut cream pie with white chocolate and toasted coconut so we shared a slice. The fluffy toppings made this dessert light and delicious! As a friend summed it up, I experienced a Tom Douglas trifecta! The people of Seattle are lucky to have him and I’m lucky to have enjoyed some of Seattle’s Best! 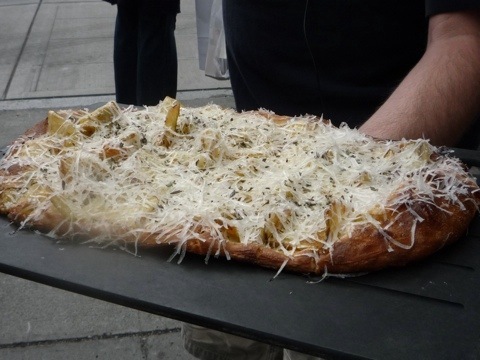 If you like Best Thing I Ever ate I recommend you check out our website, http://www.tvfoodmaps.com, we have all the places from that show listed by location or celebrity chef. We also have mobile alerts that notify you when you are near one of the restaurants on the show.